The modern greenhouse comes in a few different configurations. Different frame materials are available, as are differing styles and sizes of greenhouse. Of course largely people are driven by the amount of space available to site a greenhouse or with a particular use in mind. Weather conditions in your location can also play a part in the kind of greenhouse you go for. The most practical choice of frame by far are aluminium greenhouse frames. Aluminium is popular for many reasons. Chiefly, that it is entirely unaffected by adverse weather like rain and snow in as far as that it will not rot and need yearly maintenance like a wooden greenhouse. Aluminium frames can also be anodised. Anodising is a process the aluminium goes through to keep it looking pristine throughout its life. In other words it stays looking shiny and silver rather than going a dull grey colour as many aluminium greenhouses do and it will also never rust. 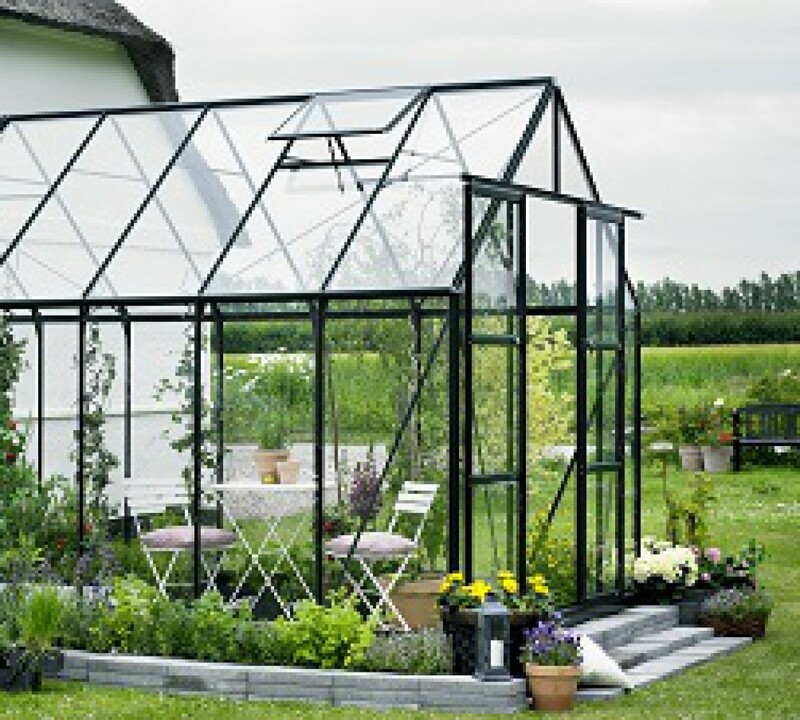 Anodised frames are standard on some brands such as Vitavia greenhouses (see below). Many greenhouses today are available in a range of colours through the application of a powder coated factory finish. Green greenhouses seem to be the most popular colour for garden greenhouses as any train ride through suburban Britain will confirm ! Some greenhouse manufacturers offer a wide choice of colours such as white, brown and black on their powder coated frames. One such manufacturer is Elite Greenhouses who offer a choice of 5 colour options at an extra cost on all of their greenhouses from the smallest lean-to to the 12ft wide and up to 40ft long Elite Classique. Though aluminium is a light weight metal it is extremely strong and hence it is suitable for carrying all available glazing options such as horticultural glass, toughened safety glass and polycarbonate glazing. Of course the major advantage of aluminium greenhouses over wood or steel is the total lack of maintenance needed as they don’t rust and will never need painting. Aluminium’s light weight also means that they are now shipped flat packed which means they are easier to transport and much easier to erect than steel or wooden greenhouses. Aluminium greenhouses popularity also means that the prices for these greenhouses are very reasonable indeed. There are many entry level greenhouses today at the sub £300 price level that are ideal allotment greenhouses featuring twin wall polycarbonate glazing and powder coated frame and steel bases. A very popular range are the Gardman green greenhouses in sizes 6×4, 6×6 and 8×6. There are some very well known brands manufacturing aluminium greenhouses for the UK market today. Perhaps the best known is Halls Greenhouses who have been making aluminium framed greenhouses since 1936 here in the UK.